This month I was assigned to send to a reader, Jayme from Tennessee. Jayme is super sweet and very involved with children. She is the children’s minister at her church and participates in the local Big Sister’s program. I give Jayme so much credit and admire the work she does. I’ve spent a lot of time in children’s media and education, because it’s something I believe in but know I don’t have the strength or patience to work with children directly. So I do what I can in my own way. Since Jayme doesn’t have a blog, she agreed to do a guest post for my blog. I’m always a bit disappointed when I get a reader as a penpal. Nothing against them, but I really like reading about everyone’s packages and especially want to make sure what I sent was good enough! I’m always on pins and needles wondering–did she really like it?? So when a reader like Jayme agrees to do a guest post I’m super excited because I still get that reading experience. Plus, I get to cheat a little by reading it before the reveal day. Of course, if it wasn’t all smiles and praises, I could just rewrite it…just kidding! Take it Jayme! Hi! My name is Jayme and I am originally from Louisiana but have recently moved to Middle TN near Nashville. 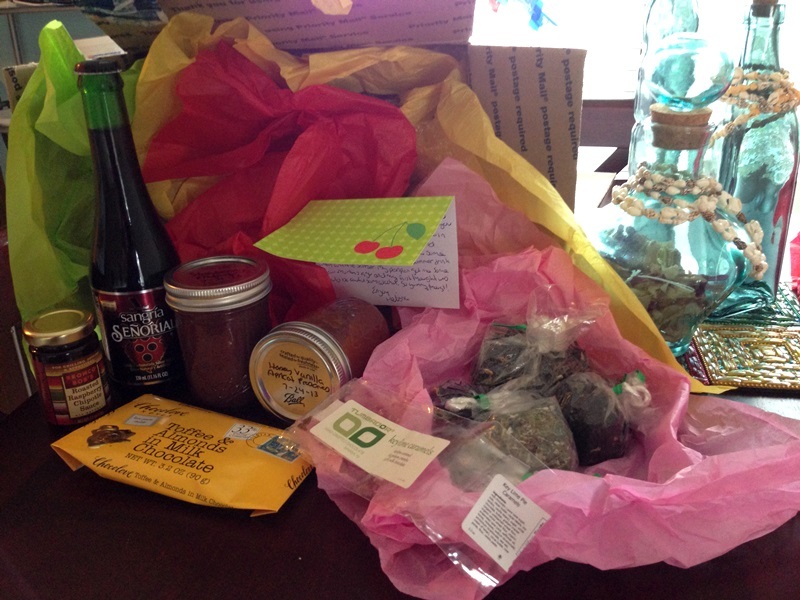 This is my first experience participating in the foodie pen pal. I discovered it on Pinterest and was intrigued. As a child I had a French pen pal and loved it and I though how great to combine connecting with new people with something you love! I am so glad I did. Immediately I looked forward to my package from Melissa. From the moment of her first email I knew this would be interesting. We both expressed an interest in trying new things and flavors so I knew I would not be disappointed. When the box arrived I was so excited. I opened it to discover a collection of wonderful goodies as you can see in this picture. I LOVE chocolate and it arrived just as I had finished lunch so I admit I tore open the Chocolate Key Lime caramel bar and ate it all up before remembering I should take a picture of my goodies, hence the clear package with nothing in it! It was delicious and very original! I also received a toffee almond chocolate bar and it was delicious but the coolest part is with this candy you get your own poem inside the wrapper. It was great! Chocolate is my weakness so I don’t keep it in the house so these were both welcomed treats. I mentioned to Melissa that I love tea and she got me a great variety from her co-op and they are delicious! In fact they were the first thing I smelled as I opened the box. I love the peach black tea the best! I don’t drink alcohol but Melissa offered me a new experience in non-alcoholic Sangria. It had a great flavor to it made me wonder why ruin it with the alcohol?! The preserves were a pleasant surprise because it wasn’t the usual preserves such as strawberries. It was a combination of flavors such as strawberry rhubarb preserves and Honey Vanilla Apricot Peaches. I love both flavors and look forward to enjoying them for some time although that may not be that long since they are delicious! The only thing I have not tried yet but plan to do so soon is the Roasted Raspberry Chipotle sauce. I grew up putting Cayenne pepper in pretty much every dish I make even desserts! I lived in New Orleans during school and I say that to mention if you ever go to New Orleans you should try the Creole Creamery’s Mexican Hot Chocolate Ice Cream (Chocolate with Cayenne Pepper)! I mention all that to say I can’t wait to see what kind of heat comes from this sauce! I loved this whole experience and it has me intrigued to see what I can find locally in my area to enjoy. I loved exploring Melissa’s hometown through her treats! 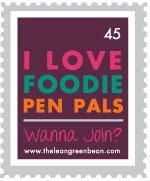 If you have tried the foodie pen pal I recommend it! Thanks again Melissa for being such a great 1st Pen pal! Foodie Penplas is open to US, Canadian & European residents. Please note, Canadian Residents will be paired with other Canadians only. Same with Europeans. We’ve determined things might get too slow and backed up if we’re trying to send foods through customs across the border from US to Canada and vice versa. If you’re interested in joining, please CLICK HERE to fill out the participation form and read the terms and conditions. You must submit your information by September 4th as pairings will be emailed on September 5th! Me too (re. going a bit easier)! Thank you for the ping back! I have to agree with the reader vs blogger (though not all bloggers seem to post either). I am always very grateful for a feedback email from a reader person though. Great post! Such a nice post, nice to meet you Jayme! I know, I love getting to include guest posts. Something different and a new personality. I really love reading about these exchanges. Thanks for sharing! You’re very welcome. I certainly encourage you to participate in one too!